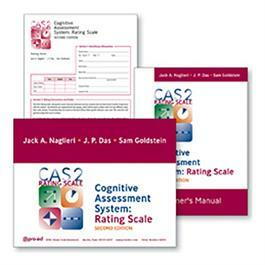 The CAS2: Rating Scale is a norm-referenced measure of behaviors related to cognitive / neuropsychological theory called PASS (Planning, Attention, Simultaneous, and Successive) completed by teachers. The rating scale provides scores for Planning, Attention, Simultaneous, and Successive scales as well as a Total Score. Each PASS Scale as well as the CAS2 Full Scale yields a percentile rank and standard score with a mean of 100 and a standard deviation of 15. The scores from the CAS2: Rating Scale can be used to (a) support a referral, supportive services, or special placements, (b) supplement a comprehensive evaluation, (c) compare teachers' ratings with test results, (d) help plan and design academic interventions by revealing behaviors and skills the teacher considers problematic or lacking, and (e) monitor the effectiveness of interventions. Results are particularly useful when used as part of a comprehensive evaluation or as a pre-referral/referral tool. The CAS2: Rating Scale was standardized using a group of 1,383 children and adolescents that closely represent the population of the U.S. Extensive reliability and validity information is reported in the Examiner's Manual. Coefficient alpha reliability coefficients range from .93 to .98. Validity studies include an investigation its diagnostic accuracy as it relates to its sensitivity, specificity, classification accuracy, and receiver operating characteristic/area under the curve (ROC/AUC).